Talking about the bizarre bike paths at the top of Tottenham Court Road Boris Johnson said this: "You get to that bit where you come to the underpass, and then the cycle route takes you on a sort of fiddly thing, where you go over… there’s a path, and you’ve got lots of oncoming pedestrians, and then you’re invited to cross at a traffic light, and so on and so forth." He's kind of right. There is a sort of fiddly thing. It's that green squiggle that is the bike lane (shown above) which you can use to come off the Euston Road, then cross two lanes of motor traffic and then hop into an advance stop box at the top of Tottenham Court Road. And pictured above is the new plan that TfL proposes here. Keeping Boris Johnson's 'fiddly thing' in pride of place. Although they chop off the end of it and dump you in that bicycle box at the end of Tottenham Court road so you can't cycle westbound any more. So, they've chopped off the end of Boris's 'fiddly thing' and made it look and feel an awful lot worse. What's really happening here is that five lanes (six if you include the slip roads) are being reduced to three. And there's still apparently 'no room' for a decent bike route through here. Which is complete bunk and they know it. Plenty of space for this sort of thing at Warren St junction. Clearly no space for a bike lane though?! Head south and the slip road that turns left towards Euston Road is going. But there's no bike path to get you past the queues of stinking buses and motor vehicles clogging up the road, waiting for the traffic lights. There's plenty of space for a bike path all the way up to the junction here but the road space is used for white lines instead that take up the middle of the road. Similar to these white lines down the middle of the road here. Lots of room to create a bike lane. But no, let's just put some hatchings down the middle of the street instead. Want to head south from Camden? Take the two lane dual carriageway into Gower Street with its gentle race track curves and then pace for what your worth down this charming urban race track - Another 1960s gyratory but with wider pavements and cycling infrastructure benefits from some, err, advanced stop boxes. There are some merits. Less slip road and simpler paths through the junction. That is probably going to calm the place down a bit. The removal of the slip roads is good. But why not make this a space you could cycle through with your kids to the shops or into the West End? Not going to happen. Oh well. What's happening is that the roads are being made narrower for all vehicles - motor cars, buses, HGVs and bicycles ALL get to share less space. Pavements get made wider. And there is suddenly 'no space for a bike lane'. This is exactly what's happened on streets like Cheapside in the City of London. As I said a few months ago, I can think of no better way to simultaneously wind up car andd bus drivers AND make cycling less pleasant and more dangerous in one sweep. It's deeply depressing. Boris Johnson has announced a complete review of cycling and safety in London (to replace the one he has been ignorning since 2005, in fact) The point is people have to feel that it's safe enough for them to opt to take a bicycle. Those of us who already cycle kind of put up with it. But even Transport for London admits that very significant numbers of people would cycle instead of driving or packing on the bus if they felt safe enough (depends on the question but numbers vary between 27% and 51% of all Londoners saying they would cycle here and would like to cycle more if they felt safe enough). This sort of scheme will do nothing to achieve that. And that's my problem with it. There's one difference this time. Transport for London is actually consulting on the plans. TfL completely ignored 650+ letters asking it to change its design at Blackfriars and ignored two London Assembly votes as well as three mass flash mob protests attracting 2,500 people to protest. But I can just about summon up the energy to write a strong response. My tone will be broadly: It's better than it is now. But it falls very short of what I think would encourage me to cycle here with a 12 year old. Or with my mum. There is a page on the Transport for London website for your comments. Enter your comments on this page here. For more background, see this TfL page here. Done! Short and sweet but asking for proper cycle paths. Looking at this plan I can see so much unused space*, and a new banned turn (from Hampstead Road left onto Euston Road) to annoy all road users. Also, the slip road leading to Gower Street is IMO ambiguous in regards to the arrows used on the approaches, but this is probably because one cannot legally have a diagonal arrow of the sort that ought to be used. I think this can be considered an improvement for pedestrians, but a wasted opportunity for cyclists. In addition to the aforementioned banned turn, we have nothing more for cyclists on the approaches than ASLs, with either no filter lane (southbound, eastbound), or a narrow one on the inside of vehicles which are allowed to turn left. The westbound cycle path appears to be marginally wider then at present (but I can't be sure with an undimensioned plan like this), but would seem to require turning right into an ASL and then turning left onto Euston Road, when it would have been possible with minimal repositioning to have a cycle crossing between the ASL and pedestrian crossing, with the cycle path continuing beside the westbound slip road and then merging again, with the ASL then used for "hook turns" from the cycle track for those wishing to turn right. *Clearly good pedestrian space is necessary, especially outside Warren Street tube station, but there is a clear surplus of pavement area on the northern side of the junction that could be used for, say, left turn slip lanes for cyclists. 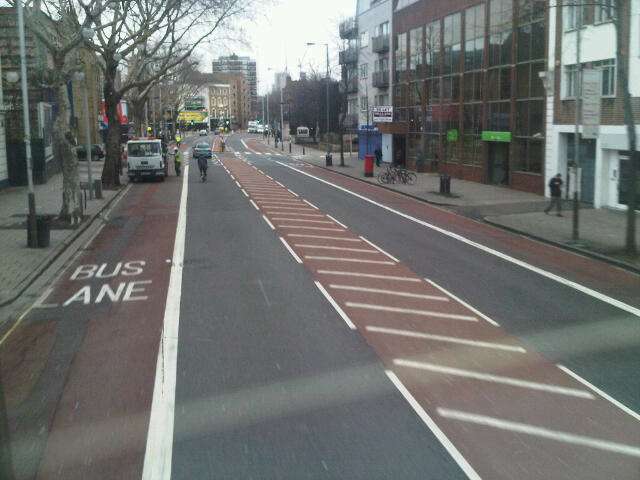 It shouldn't be impossible to construct the cycle track so that you can continue westbound on Euston Road here. What is the cost of this exercise? Maybe an FOI is in order. The estimated cost of the scheme is between £8-10 million. To be fair to Boris, trying to alter transport schemes is like changing course in a supertanker: it can take years. Many of these schemes would have been on the drawing board when he took office and changing them would have led to long delays and possibly losing the money allocated in a particular budget. That's the way councils work. That said, there's no excuse for his bullpoo and bluster over being a world class cycling city. He could adopt Dutch standards now if he wanted to do so - and he could also get in Dutch engineers to replace those in TfL who seem incapable of considering bikes. Boris has been mayor for years. he's running for reelection in three months. Nothing here could have been in an annual budget. As most of us will know ASLs, while they sound good, are quite useless when so many vehicles just don't acknowledge them. Many drivers seem to think there is no reason to not stop inside ASLs as nobody is enforcing them. A little while ago police were stopping cyclists 'riding through red lights' near Fleet Street yet vehicles were consistently stopping in the ASLs therefore making it much more dangerous for cyclists and causing lots of them to *have* to treat the red light as a flashing amber/yield rather than a stop. Confused, how does this fit with the twowayificaition of TCR? Do you suppose it was their intention to make their plan meaningless to anyone witout an intimate knowledge of how the area looks today? Certainly it is pretty incomprehensible, although Google Earth and Streetview do help a little. It would not take much effort, expense or space to provide a beter alignment of the cycle path towards the slip back onto Euston Rd so that cyclists who don't fancy the underpass can bypass it but stay with Euston Rd. Ditto they could widen this wiggly path so that South-Eastbound cyclists going towards Gower St can avoid the road around UCH. Ditto a contraflow on TCR so that Westbound cyclists could access Warren St for a quieter alternative (for a time) to continuing along Euston Road proper. Why has the left-turn from Hampstead Road (southbound) onto Euston Road (eastbound) been removed, especially with no exceptions for cyclists? It would be incredibly easy to provide a dedicated left-turn lane for bicycles at this junction, but it hasn't been done. Instead we have a huge pavement build-out (something I'm not against, per se), at a location where there is already a vast expanse of pavement. 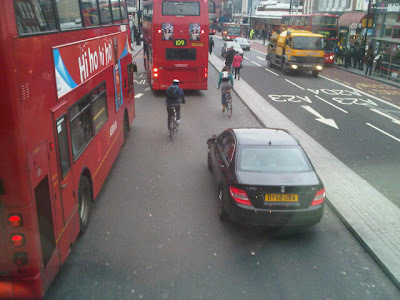 This is symptomatic of a total failure on the part of TfL to plan for bicycles. I attended a Transport Planning Society talk yesterday evening on 'Cycle Infrastructure: Are We Getting It Right?' The TfL representative, Lilli Matson, made some vague, plausible-sounding noises about reallocation of road space for bicycles, at some point in the future, but suggested it was going to be politically very difficult, and would have to be a slow and incremental process. 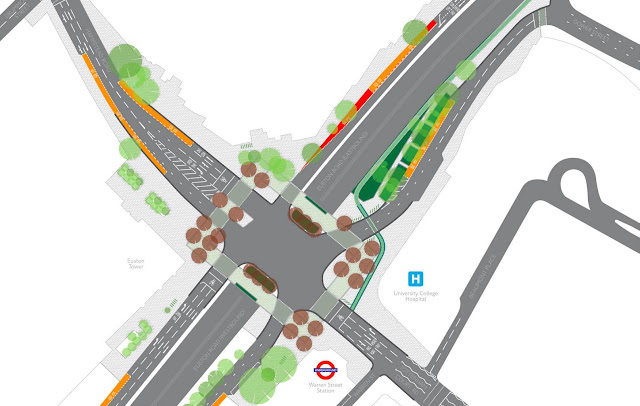 But incredibly - at the same time - TfL are presenting carriageway redesigns, like this one, that *do* reallocate road space, for much larger pavements (which I'm not sure that anyone is really asking for), and which totally ignore bicycles as a mode of transport. Schemes like this are direct evidence that TFL can, very easily, reassign road space - so I find the kind of things Lilli Matson was saying last night very hard to believe. I can't take TfL seriously at the moment. I'm sorry. It's utter rubbish IMHO. I use that junction both ways when I'm heading to and from Camden and it only just about works now as long as you don't mind racing through it! Between the idiot taxis who want to turn left at the top of TCR to go down Euston road just ignoring you and turning across your bow you then have the excellent fun of navigating the moon-surface like top end of Gower Street as you tussle for position with the cars heading the other way! Maybe it is TFL's chosen method to increase cyclists safety by designing roads so bad that all but the most experienced/brave/crazy cyclists will just give up! As you say in the blog the mesaure of a successful cycling city should be not just the number of cyclists but also the experience levels. Until we have a city where children and older people can ride around then Boris and TFL have failed miserably in their "world class" cycling city. 1.I am the first Anonymous, not the others! 2. Thanks for pointing out that the cost is £8 - 10 million. Think what you could do with that money otherwise...You could give 10,000 cyclists £400 worth of kit (cycling can be quitee xpensive and that kind of money would pay for good quality waterproofs etc) for half the spend. 3. One of the reasons for this spend is the new development on the north west corner. It's basiclaly part of a "Let's tart up London and make it look nice to developers" approach, normally in central London, which is characterised by high spend on infrastructure. 4. Re -Lilli Matson's comments. I am a local authority transport planner (one of the reasons I have to actually be "anonymous"). I remember official documents in the Local Authority I work in talking about re-allocating space from motors to bikes and pedestrians over 20 years ago. Very little has happened along these lines over that time,despite some push form some officers and occasionally Councillors. - and mine is one of the better authroities! Essentially the Councillors at the top have to be fully committed and have dedicated staff behind them as well. The of course TfL will come in and complain if we have cut capacity so that there might be some delay to motor traffic. I hope that puts LM's comments into context.